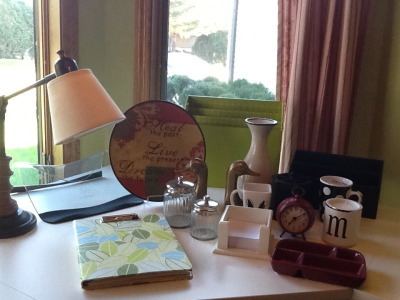 A few weeks have past since my last post and as stated, I am focusing on finding accessories for my home office. Little by little I have been gathering pieces that would be both useful and decorative on my new Craigslist desk. It is a start. Let me remind you. All items are found, thrifted items from garage sales or thrift stores. It is a work in progress…. I will be on the lookout every time I go hunting. Can you think of something I’m missing? I would love to hear your suggestions!